Is the path the goal? Walking on the VIA ROMEA means getting closer to your goal. Based on his itinerary, we can follow in his footsteps today. Europe does not grow out of papers, but out of people who open themselves up to meet people from other countries and cultures, with other languages and ways of life. The VIA ROMEA, through its historical route from the 13th century (through four German federal states, the three European countries of Germany, Austria and Italy with its six crossed regions) from Stade to Rome, can open the eyes for a long shared common European history with its religious, local and cultural aspects. As a way of encounters today, the VIA ROMEA wants to set elderly and young people, whether pilgrims, hikers or travellers, in ecumenical openness, today and for future generations, in motion to overcome all kinds of borders, to appreciate different cultures in their own particularities, but also to reconnect peoples through the recognition of common traditions and values, and to possibly find “oneself”, that is, one’s own spiritual or human identity. What’s up on the VIA ROMEA? Encounters of people on the route and people living along the route. The VIA ROMEA connects three European countries. Germany, Austria and Italy. The North Sea with the Mediterranean Sea. On the way of the VIA ROMEA there are still real, authentic, honest, sustainable experiences with nature and people. The VIA ROMEA is still an inside tip in pilgrims’ circles. Not everyone knows the way to Rome on this pilgrim route. The VIA ROMEA is a historic route. Not artificially created, but historically documented by Abbot Albert. 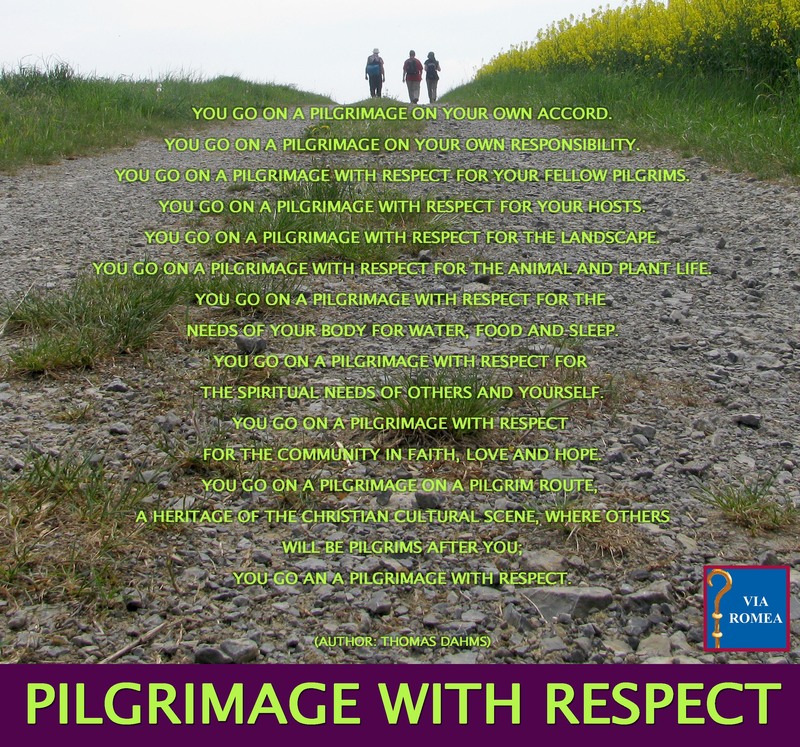 We want to develop the path further with respect for the hosts, pilgrims, landscapes, needs and beliefs.